Like many, I was going through my mail one day and got the dreaded jury duty summons. It was for standby jury so you have to call the day before so see if you are needed. I called and the recording said if your last name begins with certain letters, you are required to come in, otherwise you will be called at a later time. My name happened to be in this range so I was required to report for jury duty. I commuted to the city and arrived at the courthouse building. There are metal detectors when you walk in so you have to put everything through the scanner. It is ok just an inconvenience. Then you take the elevator to the check in location and waiting room. We were told to arrive at 9:30am. It is a big room with a lot of people waiting. They showed an orientation video and then we waited for our group number to be called. My group didn't get called until about 12:00pm, so there was a lot of waiting. They did have a tv to watch and you can bring something to read or go on a laptop or phone. After we were called, we went to a court room where they talked briefly about the process. Then we moved to another court room on another floor and heard a little bit about what the case would be about. Our group had about 40 people to start. Then we had an hour for lunch. They don't have much in terms of a cafeteria or anything, but you can leave the building to go out. I brought my lunch an ate in the hall/lobby area outside the courtrooms. We were supposed to meet back at about 1:30pm but they were not ready until about an hour after that. Then they went into a process of calling people in, having some sit for questioning while the others waited. I didn't even get called in for questioning until about 4:00pm! To me this does not seem very efficient considering I was told to be there at 9:30am. The lawyers of both sides ask questions to each person in a group setting based on the form you filled out ahead of time. They want to make sure you will be a fair juror and not have bias to one side or the other. I did not like this process because they are asking you questions in front of a huge group of strangers. It is almost like you are on the witness stand! Because of this format, people are likely to just go with the group, especially when they ask a question to the group as a whole. There are clearly people who try to make their answers seems like they would have bias because they don't want to get picked. Also people are less likely to be 100% honest when they know everyone is listening to their answer, even though you are supposed to be 100% truthful. They definitely need to improve this process. If they want to know specific answers to questions, they should have the jurors fill out these answers on the card, not answer them in front of a court room full of people. Also they should only have you arrive at the time they are ready to bring you in for questioning. After all of this, they announced who the 12 jurors would be. I ended up getting picked. Now I'm not an expert on jury selection but I think they try to pick people who they think are easily influenced and will be fair. I feel like I must have given off this impression. We were finally dismissed at about 5:30pm. A long day, especially when you only get paid $17 for the the entire day which pretty much just covers the cost of transportation to get down there. So far my impression of the jury/judicial system here is not good. The case will be a civil case to decide how much money is to be paid. It seems like something like this should be decided by a judge if there is a dispute. It is not worth inconveniencing so many people for an entire day or more for something like this. 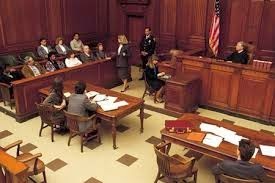 From what I understand if you go to court, you have the option of having a judge or a jury for your case. I would definitely pick a judge after this experience so as not to make more people come in for something like this. I showed up at 9:30am for jury day 2 not looking forward to it. They did provide pastries and juice for breakfast as well as let us pick out something to order for lunch which was nice. The jurors and I signed some papers and chatted a bit while everyone made their way in. A short while later we were called in to take our seats and they started the case. Both sides took turns explaining their side. A few witnesses were called up for questioning and were examined by both sides. Often there would be a need for a break as the attorneys would ask for a sidebar to talk with the judge. The case itself was pretty simple but they really dragged it out. I guess this is the way it is done, but I really wished they could just get to the point instead of asking 20 vaguely relevant questions before getting to a point. We got a lunch break around noon and resumed the case afterwords. At about 4:00pm they had wrapped up what they wanted to say and it was up to us as jurors to decide the outcome. We deliberated for about an hour. Our group got along pretty well and we just went around saying what we thought the outcome should be and why. After more discussion we reached a decision. It was for deciding a monetary value so we kind of had to get an average based on what everyone thought was fair. We went back in and handed over the results. They were read to the court and that was it! We went back to the jury room to just wrap things up with the judge and then we got to go home. Overall it was an ok experience but personally I think this type of case should be done without a jury and the process in general needs to be much more efficient and streamlined. In my opinion a case like this could have been decided in a couple hours by a judge. Instead it took 2 days and a lot of people to come in to listen to it and decide the verdict. It was good to get the experience of being on a jury, but overall I would not look forward to doing it again.